My son Krishnangshu has been fighting Acute Leukemia (ALL) since it was diagnosed on Dec, 2014. 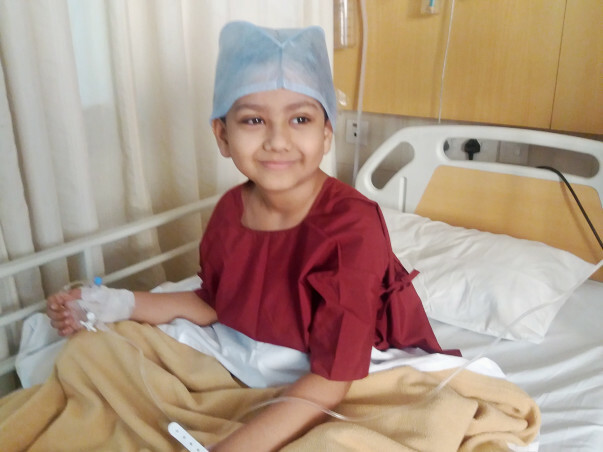 He received proper treatment at Tata Medical Center, Kolkata for 3 and 1/2 years which was completed on May, 2017. Unfortunately relapse happened only after 2 months and again he had to undergo 4 cycles of Chemotherapy (from August, 2017 to Feb, 2018) following which he has been advised to undergo Bone Marrow Transplant as doctors said it has the best chance for cure. 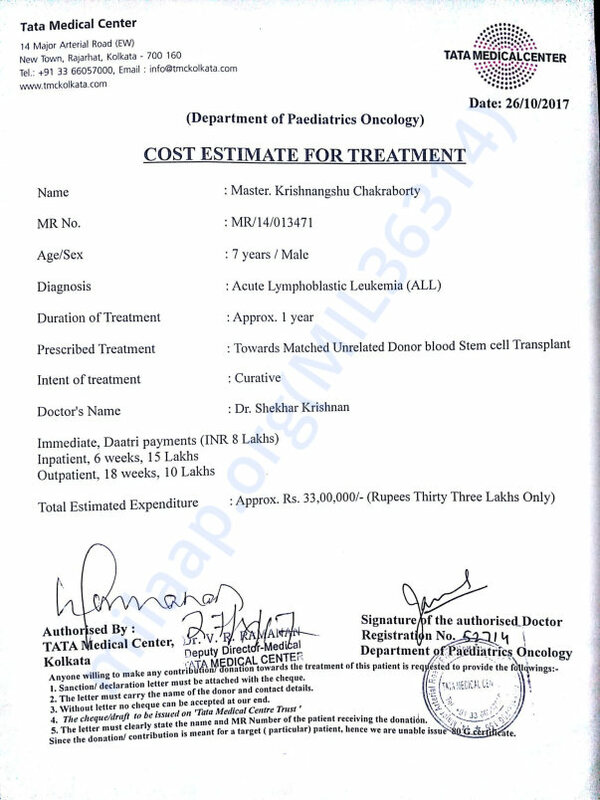 This is a very costly process and the minimum cost estimate for the treatment quoted by the hospital is 33 lakhs. This estimated amount is likely to increase in case of complications which are common during stem cell therapy. After spending all my savings during course of his treatment, I have taken personal loans from SBI and relatives to raise upto 25 lakhs. My son is presently undergoing 6 wks long bone marrow transplant process in the BMT Unit of Tata Medical Center, Kolkata where he has been admitted on 14th April, 2018. I would be grateful if I may get some help from any good hearted people as I am yet to raise the full quoted amount of 33 lakhs by the hospital. Any help extended would be a great help. Thanks. Kishnangshu was discharged from Tata Medical Center on 15th evening. He is stable now and will be observed closely by the doctors, for any irregularities in his health. The doctors have told us he will need to come for regular checkups for about four months. Thank you all once again. Thank you for the wonderful support that you have shown towards my son Krishnangshu. He is doing better now compared to earlier. He has successfully completed the prescribed chemotherapy cycles and his response to them has been positive. He has undergone the bone marrow transplant procedure as well and this is the 3rd week after that. I just hope that he recovers from it completely. I would request you all to please pray for his health and speedy recovery. He needs your support and blessings the most. Will keep you posted.